Click on the photo below to go to the CD page. Listen to sound samples and order! 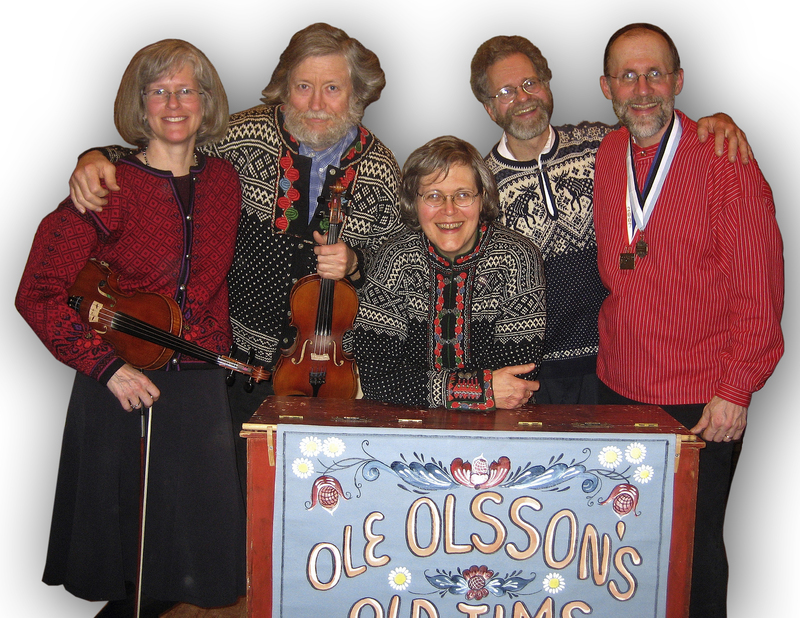 Ole Olsson’s Oldtime Orkestra (usually referred to as O.O.O.O.) 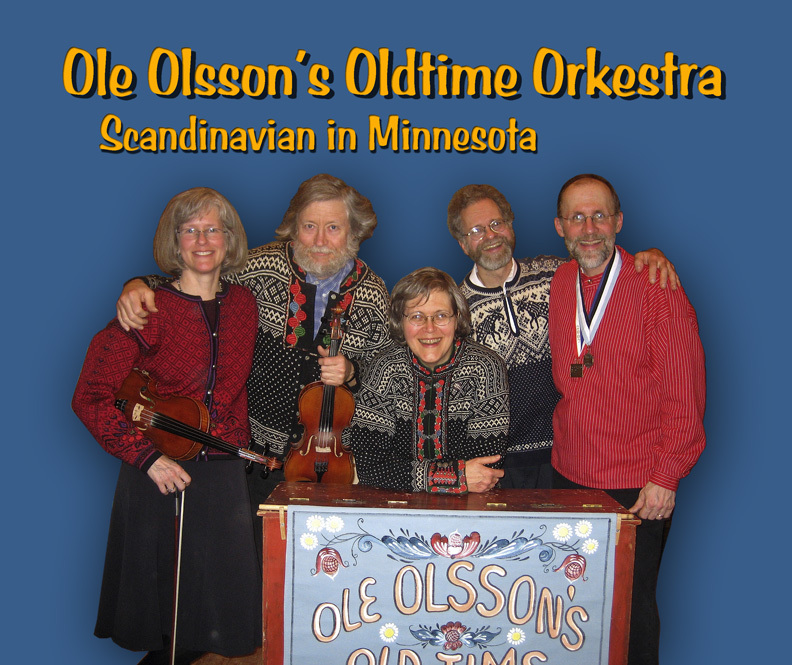 is a fun loving group of musicians who first met at the Good Templar Hall in Minneapolis, Minnesota playing for Scandinavian dances in times gone by. Nowadays, they still play some pretty darn good Scandinavian music for oldtime dancing and/or just plain enjoying. They play fiddles, accordions, pump organ and guitar, and sing some funny Scandinavian vaudeville songs that may occasionally make Lutheran ladies smile. They play for festivals and lutefisk feeds all around Minnesota and even make it out of the state once in awhile in their old yalopy to perform in far flung places. They have traveled from New York City to Thousand Oaks, California; from Minot, N.D. to Swedesburg, Ia., all in their quest to spread the joy of Scandinavian folk music and perhaps find the perfectly formed piece of lefse. Stockholm, Wisconsin • Stockholm, Sweden • Thousand Oaks, Ca. • Östbjörka, Sweden • New York City, Ny. ·) Art Bjorngjeld lives in Brooklyn Park and is a veteran performer, playing fiddle, accordion and guitar. He grew up in a musical family and is a talented musician himself. He has been known to sing “All Pooped Out” in the shower. Art also performs as a solo; with the well known trio, the Minnesota Scandinavian Ensemble and plays for the Swedish and Norwegian folk dance groups in the Twin Cities. ·) Char Bostrom lives in St. Paul and is also a veteran performer. Char’s favorite style of music is traditional Swedish fiddling, but she puts up with the Norwegian antics of her bandmates. Besides performing in Ole Olsson’s, she plays solo fiddle for polska dance lessons and dance camps all around the country. Char also plays for the Twin Cities Swedish Folk Dancers. ·) Mary Abendroth lives south of Deerwood, Mn and has been performing music for most of her life, starting with choirs in high school, going through travels around the world with COMEX, a singing/performing group similar to Up with People, to performing as a duo with her husband Paul Wilson all over the midwest for the last 28 years. Mary has a wonderful voice, singing in Swedish and has a very deft touch on her preferred instrument, the pump organ! ·) Paul Wilson has been playing traditional Scandinavian music for 30 years. With Swedish grandparents and Norwegian great-grandparents, Paul's wide interests have led him to studying musical traditions from all the Scandinavian countries. This is reflected in the festival that Paul founded called Nisswa-stämman. It is a pan Scandinavian festival embracing the music of Sweden, Norway, Denmark and Finland. Paul plays 'drone' fiddles that he builds himself and also plays the 2 row button accordion, guitar and sings dialect "swinglish" songs like Nikolina. ·)Bruce Bostrom is a veteran performer and raconteur with a fantastic necktie collection. Bruce is one of the best munnharpe players in Minnesota and claims to have an inside track on the where-abouts of Ole Olson himself! Hear Bruce performing on his harpe here. 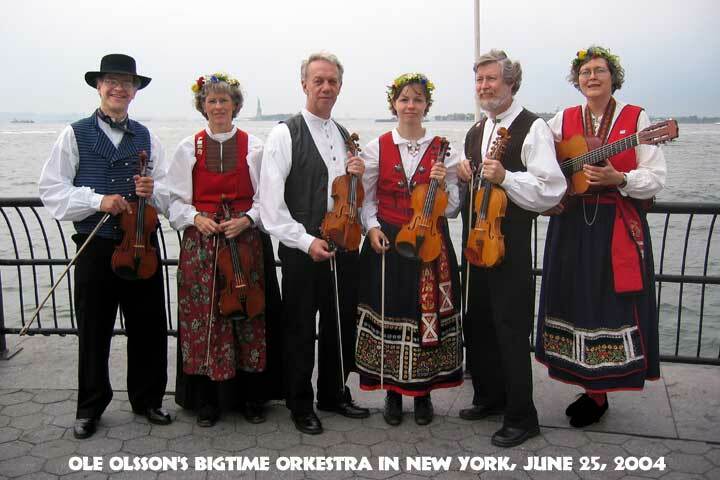 Ole Olssons Bigtime Orkestra performed in New York city for Midsommar i Manhattan, twice! Click here to see photos.